This all purpose, indoor/outdoor all natural organic chicken litter compost provides extra nitrogen and calcium. 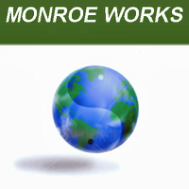 Enhances plant growth, flowering, and fruit production. Mix 40 pounds VermaMax® per 1000 square foot into the top 3 inches of your garden soil in the spring before planting. Mix 1/2 - 1 cup VermaMax® in transplanting hole. Spread 1 - 2 cups VermaMax® around plants and work into first 3 inches of soil. Apply in the spring and fall. Mix 1 part to 4 parts VermaMax® with your potting soil. 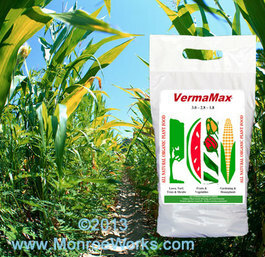 New: Mix 1 - 2 cups VermaMax® with your garden soil in transplant hole. Established: In spring and fall, mix 1 - 2 cups VermaMax® per 1 inch diameter of tree, from the trunk out the the drip line, into the top 3 inches of soil. In spring and fall, mix 3 - 5 cups VermaMax® around plants, into the first 3 inches of soil. New: Spread 40Lb. VermaMax® per 1000 square feet over entire area to be seeded. Rake in. Established: Sprinkle 20Lb. VermaMax® per 1000 square feet over entire lawn surface as a top dressing during spring and fall. Substitute 1/3 of Pure Black Castings® with VermaMax® when preparing potting soil, transplant backfill, or turf/lawn broadcasting. Because of the extra nitrogen content in VermaMax®, wait one week after applying VermaMax® before applying VermaPlex®. Keep VermaMax® back from tender young plants and water in well. Analysis.